…Everyone who listens to my Father and learns from him comes to me. Recently, the daily Bible readings from the lectionary included the two passages above as complementary passages that both speak profoundly of a spiritual reality given to us as God’s people and the devoted followers of Jesus His Son. I was reminded as I meditated on these readings of the scene in the movie, “The Fellowship of the Ring”, in the Lord of the Rings trilogy, where the Fellowship of the Nine are preparing to make their departure from Lothlorien, the land of Celeborn and Galadriel and the ‘heart of elevendom on earth”, with gifts given them by the elves for the demanding and dangerous journey ahead of them. I was struck in the readings above by the uplifting insight contained in Elijah’s experience of being in a place of depression, fear and fainting in the battle he was facing in his own time. In fact, he sounds despairing asking the Lord God to take his life. In an act of exhaustion from all he was facing and feeling, he fell asleep – sometimes a form of denial we all seem prone to succumb to when facing things that seem desperate or that weigh us down heavily with depression or discouragement. then strengthened by that food, he walked forty days and forty nights to the mountain of God, Horeb.” What leaped into my awareness with that concluding sentence is the phrase “strengthened by that food…” The prophet was strengthened supernaturally by “that food” to walk forty days and forty nights to his rendezvous with God’s appointed purpose and preparation at the mountain of God for the next leg of his journey. I began to realize a new significance to the first quoted scene between the two hobbit friends above in speaking of the gift of elvish “Way bread” that would give them supernatural sustenance for their arduous journey ahead. It is interesting to me the further I go on my own journey of faith that sometimes we seem to be satisfied with “one small bite” of this heavenly Way Bread, an occasional partaking of the Lord’s provision for us, when He has offered us an abundant banquet that begins here, continues to be available for the whole journey and culminates in the Great Banquet at the end. In our Savior’s prayer He taught us as his disciples, He comes to the line, “give us this day or daily bread”. Many of the early Church Fathers and teachers saw in this line the fulfillment of Jesus’ own teaching in John 6, also quoted above, that He is the Bread that has come down from heaven and that whoever eats of this Bread will live forever. Our Lord continues, “…and the Bread that I will give is my flesh for the life of the world.” The early Christians saw Jesus as this “daily bread” that had come down from heaven, that had become indeed for them true food and true drink. In light of this understanding, the early followers of our Lord Jesus began to realize that the supernatural Presence and sustenance of the Lord’s own risen and glorified humanity, as well as His divinity, was available to them as heavenly “Way Bread” to strengthen them with supernatural grace to face all the battles and challenges of this life’s journey of faith. 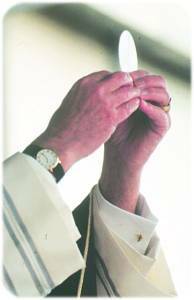 In fact, often in the first 250 years of the Church those believers being sent to their deaths in arenas and coliseums or being held in prison awaiting such a fate, hungered and thirsted to be able to partake of the Eucharist as often as possible before giving up their lives for their Lord. They realized the power of “that Food”, this “daily Bread”, to uphold them when all else seemed to have failed. 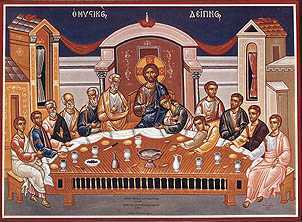 Many a martyr of the first 3 centuries of the faith prepared for their deaths by simply dining on the Banquet of Life they had been given in Jesus’ assurance that this was “My Body given for you…and this is My Blood poured out for you and for many…”. It may be true that one small bite will hold us for a while, and certainly will benefit us, but those who hunger and thirst are the ones who benefit the most and have been promised they will be filled. Our Lord Jesus Himself made this point so clear for us when he walked with the two disciples on the road to Emmaus after His resurrection. He joined them in their journey as a ‘companion’, which is taken from two words compounded together – com and pan – meaning one who breaks bread with us. Christ has promised us His own Presence in such a sustaining manner as the One who breaks Bread with us; who gives to us His own Life to strengthen each of us for the race that we have set before us. Let us not, then, neglect this priceless gift God has given us for our journey, “that Food”, the heavenly Way Bread that will enable, empower and strengthen us with supernatural Life for the whole journey and will be the central offering of the Great Feast at the end of our journey. Jesus is our “lembas”; He is our Way Bread. This entry was posted in ENCOUNTERS & EPIPHANIES and tagged encounters & ephiphanies, mysteries & paradoxes. Bookmark the permalink.